What is BuckleyBoo? This Christmas your are likely going to see the new BuckleyBoo toys which are designed to be a fun and educational toy for toddlers and babies. Read our BuckleyBoo Review so you can see if it is a good choice for your young child. They are lots of different BuckleyBoo toys so that you can find the perfect one, or collect more than one for your child. As parents we know that we are always trying to find educational toys but of course your child has to be fascinated by the toy to make it worth buying. BuckleyBoo are a great toy to keep parents and kids happy! 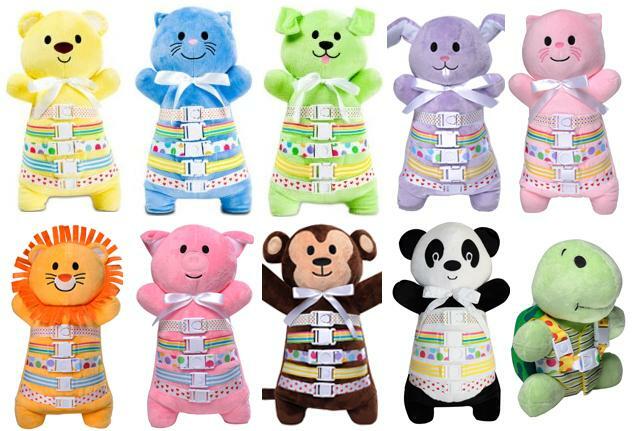 Very highly rated by parents and kids actually want to play with these cute soft toys with an educational element. They were created by a child psychologist and grandma – what a perfect combination! There is a whole range of BuckelyBoo toys which range in price from around $19.99 to under $30 so the price is just right. The suggested age range is 18 months to 4 years. What is the idea behind BuckleyBoo? We all know that young children often play with regular household items rather than toys. The creator of these toys was inspired by this idea. She noticed that her niece didn’t want to play with the toys that she had, but instead wanted to play with the buckle on her diaper bag. So BuckleyBoo was the result of this first idea! Why the name BuckleyBoo? Inspired by the idea that babies and toddlers love playing with the buckles these BuckleyBoo are dolls that have buckles strapped across their tummies. There are 2 sizes available. The larger one is 17” high and the smaller, mini BuckleyBoo is 12″. The larger ones have 5 buckles whilst the minis have 3. There are lots of different animals and colors to choose from in the BuckleyBoo range. which retails at around $25 on Amazon. 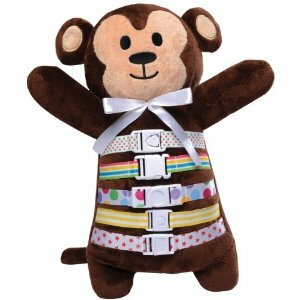 There is also a smaller version – the BuckleyBoo BuckleyMonkey 12″ Brown is just $17.48 right now. How are BuckleyBoo Toys Educational? The first skill they develop is learning how to match the design on the ribbons. So your child needs to work out that the striped design snaps to the other striped pattern , and the polka dot one to the polka dot and so on. The second stage is when your child works out how to buckle the two matching pieces together. Parents report that their babies and infants really like to hear the sound of the buckle snapping into place. You know how fascinated your child is with the highchair straps? Well they are going to love this element on a toy when they can actually achieve it themselves. After buckling of course they want to work out how to unbuckle! This is the most difficult part for a small child and practicing helps to develop motor skills and strength. But the added benefit of the BuckleyBoo of course is that they are so cute. Your child will most likely become really attached to it and want to take it everywhere they go. They will be as loved as any other soft toy! Which one is your favorite BuckleyBoo? Spider Man 3 (2 Disc Special Edition) DVD just $5! Hurry: FREE Target Beauty Bag Filled with Products! Groupon: 5 Pc Emeril Lagasse Cutlery Knife Set just $29!